The hardest part of buying a new car, truck or SUV isn’t deciding which model vehicle you’d like to drive home in – most of the time, shoppers already know exactly what they are in the market for. No, the hardest part of buying a new vehicle is trusting that the dealership you’ve decided to do business with is trustworthy, honest and looking out for your best interest. 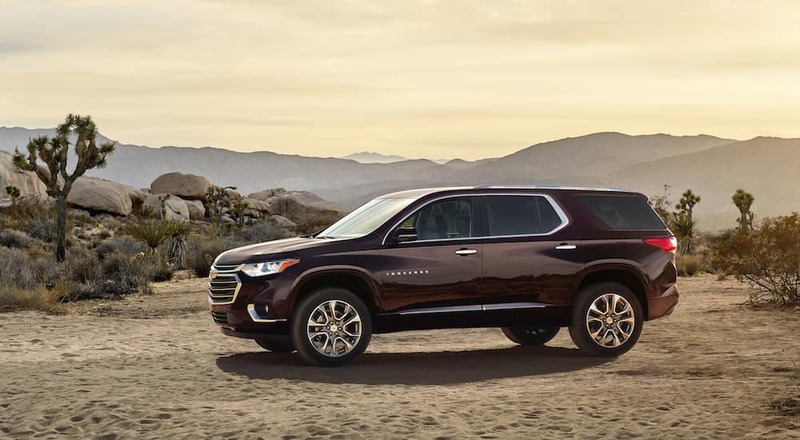 That’s why Nashville-area car shoppers know that when they are looking to purchase a new Chevy SUV, they only need to come to one location – Carl Black Nashville. We take the utmost pride in our inventory, sales staff, and our service. We know that car shopping can be an overwhelming, daunting and financially-stressful event in a person’s life, which is why we go above and beyond to ensure that each and every person who enters our dealership knows that at Carl Black Nashville leaves feeling satisfied and secure in the fact that they have made a purchase that they are confident in, be it one of our amazing Chevy SUVs, one of our superb Chevy sedans or even one of our various pre-owned certified vehicles. At Carl Black Nashville, we know that choice is important. After all, have you been to a grocery store lately? If they can stock an entire aisles worth of different types of sliced bread, then you better believe we can stock our lot full of diverse and quality inventory. Sure, we have Chevy SUVs, but we also have excellent sedans and trucks – all brand new! Looking to save a pretty penny or two? Well, why not check out our outstanding pre-owned inventory? We offer both standard pre-owned models and certified pre-owned models – in fact, we even offer a factory pre-owned collection that you can easily view right on our website. Additionally, we know that price matters. That’s why we offer specials on both our new and our pre-owned inventory. Priced to sell, our specials are less about offering our shoppers an incentive and more about demonstrating our commitment to offering great cars at a great value. Visit our website to see our specials and to check out our new and pre-owned inventory, and you’ll soon see for yourself that at Carl Black Nashville, you don’t have to make a choice between a few “okay” models – we have so many cars, trucks and SUVs for you to explore, the choice truly is yours. Don’t limit yourself to shopping at a dealer that only has a small selection of vehicles to choose from when it’s easier, faster, more convenient and more fun to explore all of your many choices – either right on the lot or right online! Car dealerships get a bad name, primarily because some dealers allow their sales staff to push customers into buying inventory that ultimately the customer just isn’t satisfied with. At Carl Black Nashville, we want you to drive off the lot in your new Chevy SUV, car or truck feeling more than satisfied with your purchase – we want you to be beaming with joy! That’s why our sales staff is never pushy and will never try to convince you to buy a vehicle that you aren’t sure really fits into your life. Our sales staff is here to help guide you through the car shopping process – starting by getting to know you and your lifestyle and answering any questions you may have. And while it’s true that many shoppers come to Carl Black Nashville already knowing which vehicle they are interested in buying, it is also true that many of our clients just aren’t sure which ride is right for them. Our dedicated sales staff is more than happy to show you our extensive inventory and discuss the pros and cons of different makes and models with you. Consider our sales staff your guide to finding your ideal car based on your interests and your price point. Our sales team is so dedicated to helping our customers find their dream vehicle that they are onsite and ready to greet you seven days a week. From Monday to Saturday you can chat with a member of our sales team from the convenient hours of 9:00 AM – 8:00 PM, and on Sundays our sales team is available from 12:00 PM – 5:00 PM. We know that car shopping can be an arduous process that can easily eat into your busy schedule, so we offer hours that we hope work with yours. At Carl Black Nashville, we know that taking a day off of work to car shop isn’t just a hassle, it’s an imposition – so we stay open later to accommodate the typical workday. It’s just one small way we show our consideration and our gratitude to our shoppers. Once you drive off of our lot in your new, or new-to-you vehicle, it’s easy to forget that for the health of your automobile, you’re going to need to stay on top of its scheduled maintenance and service appointments. At Carl Black Nashville, we know that your car is a big investment and that you need it to stay in top working condition so that it can be remain reliable. That’s why our service department is open six days a week, Monday through Friday, from 7:00 AM to 6:00 PM, and Saturday’s from 7:00 AM to 4:00 PM. We know it can be a drag to have to wait while your car gets its checkup, so we hope our extended service hours and efficient service lessen the hassle of having to drop by for a quick oil change or tire rotation. More than just great service hours, our highly-skilled Certified Service technicians go above and beyond to ensure the well-being of your vehicle. We offer easy service scheduling right online, and we also have a price match guarantee that is good for up to 30 days after your service purchase. It is our goal to provide our clients with the utmost in professional service, and that means providing competitive prices. In addition to our competitive prices, we also offer service specials to keep costs down for you as you maintain the health of your car, truck or SUV. Be sure to check our website frequently for our service specials, or simply give us a call at (888) 498-9760 and we will be happy to walk you through our current special offers. We would be remiss if we didn’t touch on our amazing finance department. After all, the financial aspect of purchasing a vehicle is almost always the most stressful part – no matter how great your credit or how much cash you have for a down payment, it is always worrisome to make such a pricey investment in machinery. However, our finance department is here to help you feel confident in your buying process – even before you step foot through our doors! You can go straight to our website to get a free estimated credit score so that you know approximately where you stand with the credit bureau – which is very helpful information when it comes to working out financing terms. Additionally, if you are planning on trading in a vehicle for collateral, you can easily value your trade right online, which will give you a helpful starting point to figuring out exactly how much car you can afford. There’s no reason why shopping for a new car, truck or SUV should be a stressful experience. At Carl Black Nashville, it’s our goal to give each and every one of our customers the best car shopping experience possible. So come visit us today 535 Murfreesboro Pike in Nashville and see how we make car shopping a pleasure.